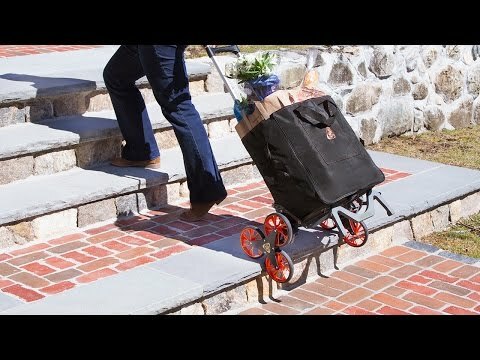 This three-wheeled, all-terrain folding hand truck can haul 77 pounds of groceries and supplies up and down stairs. Load up its three-tiered bags with anything you might need. And when you’re done, UpCart folds down to just over four inches for super easy storage. It’s ready to lend a hand with whatever you’re hauling. Dimensions: Unfolded: 22.64" x 23" x 45"; Folded: 23.7" x 24.8" x 4.6"
I love my cart. It saves me many trips from the car to the house. Wish I had both got it sooner. Virtually any surface is fair game for these all-terrain, folding hand trucks. UpCarts can trek through sandy beaches and scale stairs like it’s nobody’s business. Whether you’re at the beach or going from your car to the front door, these rugged helpers travel light and fold flat. 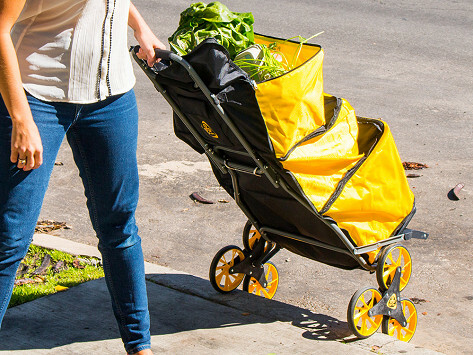 The carts have three super-tough wheels that do the heavy lifting up and down stairs. You’ll have an extra pair of “hands” after a thorough trip to the grocery store or the bustle of a move out day. Robust and easy-to-store, UpCarts are ready to ease the load wherever you go.